Books are available for sale now at bookstores and online through Amazon, IndieBound, and other retailers. It’s also at Weaver Street Market in the Triangle, other NC co-ops, Carolina locations of Whole Foods, and, at least through the summer, Costco stores in the Carolinas, as well as at many NC specialty stores, wineries, and more! 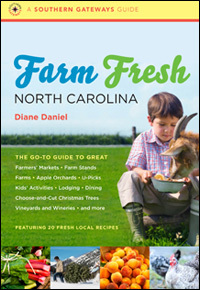 You can save 20% off list price when ordering from UNC Press. Just click here, put the book into your shopping cart, and enter the promotion code 01ENEW at checkout. So how do I get some autographed copies of your book? I’d love one for myself & Dad! You look so much like Nancy Frohling that it’s astonishing. Has anyone ever mentioned that to you? You’ll be getting copies, don’t worry! Yes, Nancy and I are well aware of our resemblance!